Thomas poses for a photograph dressed in the kilt of the Black Raven Band which he founded while a teacher in Corduff National School, co. Dublin. The Ashe (originally D'Esse) family came from France at the time of the Norman conquest and settled in Devon, from where they crossed over to Ireland, various individuals or families probably at different times. McLysaght in his Irish Families tells us that the Ashes were domiciled in Kildare and Meath since the fourteenth century and are recorded in the sixteenth century as among the leading gentry there. Branches dispersed to various parts of Ireland and are found in Limerick, Cavan, Louth, Derry and Antrim. It is not improbable that the Captain Thomas Ash who defended Derry for King William in 1689 came from the same roots as Commandant Thomas Ashe, who occupied North County Dublin at Easter 1916 for the Irish Republic. Once of the family mottoes was "Fight". Fight they did, for whatever cause their convictions upheld. The motto, however, by which the family is particularly identified, Non nobis sed omnibus is nowhere made more manifest than in the life and death of Thomas Ashe of Kinard. Modern-day Ordnance Survey map of Kinard and its vicinity which shows the topographical features of the area. Tradition has it that the Ashes of West Kerry came from Kildare, where, in a time of turmoil, a stubborn Ashe, loyal to his conscience, was hanged for being a rebel, and other members of the family, refusing to renounce their Catholic faith, had their lands confiscated and were forced to leave. Moving south, as did many other midland families in similar circumstance, they settled at Murreigh near the shores of Smerwick harbour in the extreme west of Dingle peninsula, not far from the ancient oratory of Gallarus. A country of surpassing beauty, it was not without its memories. Looking across the harbour, they could see Fort del Oro, where Walter Raleigh dishonoured his pledge to eight hundred Spanish prisoners-of-war, a grim reminder to the recent outlaws of Kildare. Already in the midlands the Ashes may have come under the influence of Gaelic Ireland and the separate identity associated with it. Be that as it may they thoroughly assimilated with their West Kerry background and absorbed, if indeed they did not already possess, the civilisation and culture of their Gaelic milieu. Cherishing its literary heritage, scholars of the family copied the poems and histories of Ireland in manuscript, since print and all forms of Irish development were curbed or denied. In 1762 – 63, Seamus As copied in the town of Dingle the entire text of Geoffrey Keatings's History of Ireland along with genealogical tracts and poems, and his manuscript with its fine print-like penmanship may be seen in the O'Curry Library of University College, Dublin. 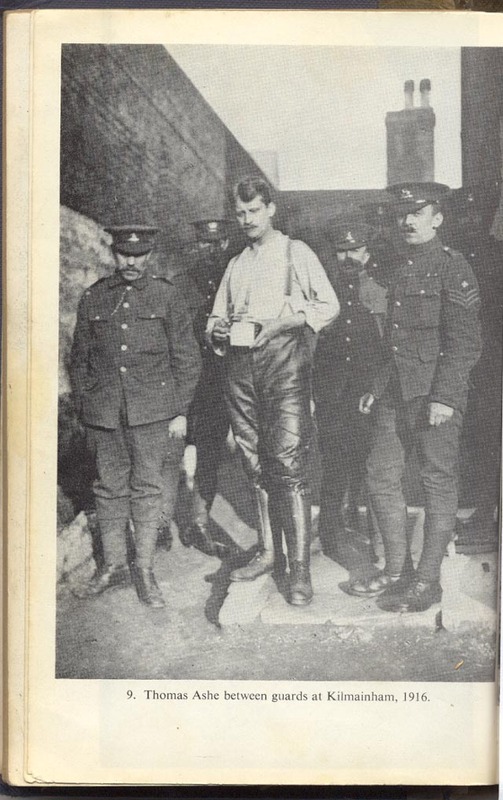 Ashe in striking pose between guards at Kilmainham Jail,Dublin 1916 in the aftermath of the Easter Rising. According to his son's biographer Sean Ó Luing ,Gregory Ashe was a man " of unusual talent and character.He worked hard on his land and devoted himself to bringing up his family..He cultivated, too the gifts of his finely endowed mind". Thomas's younger brother,Gregory recalls the profound influence of his father on Thomas. 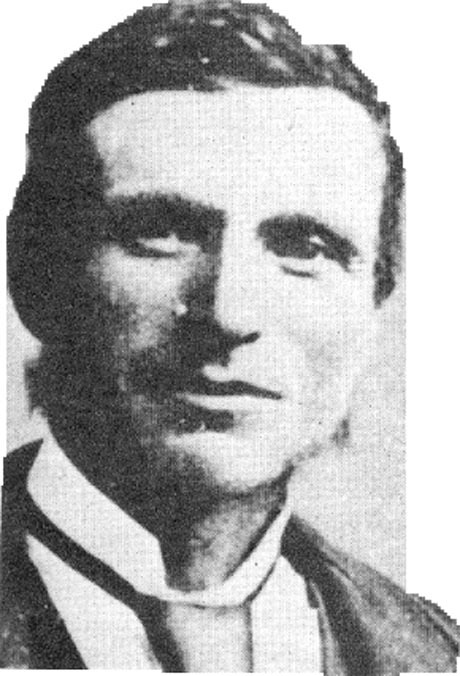 "My father impressed Tomas immensely.He transmitted him a great store of seanchas,legend and songs.My father was a very good singer.Some nights he would begin to sing at seven o'clock and the company of neighbours seated around would sing each in his turn and so the night passed until ten o'clock.Tomas himself had a very fine voice." Gregory Peck was well suited by temperament to play roles that required leadership qualities and moral authority. 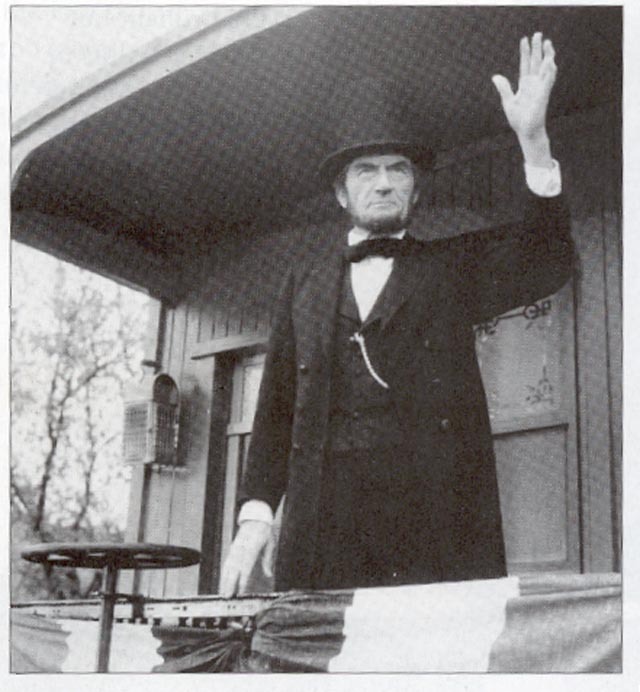 One of his ambitions was to play the role of Abraham Lincoln of whom he said "he's the ideal American the one that we think embodies the best of us all." Like his kinsman ,Thomas Ashe Peck had a lifelong interest in history. My family seems to have settled around Charleston and surrounding towns in South Carolina USA.Just found this sight.Would like to hear more about people and places that are connected to my orgins.